A lively menu struggles not to be overshadowed by the coffee, with Spanish-accented hits such as the Pork Belly Sandwich with smoked paprika relish and aioli. ¬°Hola! But yes, in the end, the coffee steals the show -and not only because of the spanking blue six group Synesso, as well as a swag of grinders and syphons. The Brazilian sambas into a macchiato, and a nimble sweetness dances on the palate with flourishes of lime and a sultry acidity. The length of the shot – which definitely has legs – is matched by headpiece of delicately structured milk. Take a bow, Mary, wherever you are. 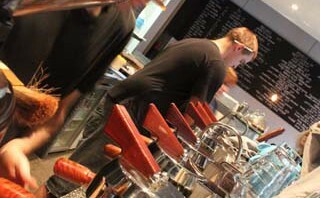 This entry was posted in testcat and tagged 5 beans, awards, breakfast, collingwood. Bookmark the permalink. Great coffee, good service. Will def be back – soon!